We’re uploading the whole series (51 cards total). If you’d like to download the whole set, click here for the file (2.4 mb). They have a Bible reference as well as some points to remember the character. The Bible reference is a general reference. I have put the books that they are mostly in sometimes spreading through entire books of the Bible. There are places that these characters are in the Bible that I didn’t put on the card. Again, this is a general reference place for the kids to look in to learn more about the character, if they want. The disciples are listed individually, but mostly they are grouped together as “Jesus and His disciples”, so I decided to just put that they were in the Gospels and/or Acts. I have made these cards to that you can print them out (probably on cardstock), cut them on the solid lines, and fold them in half, and glue them, on the dotted lines. 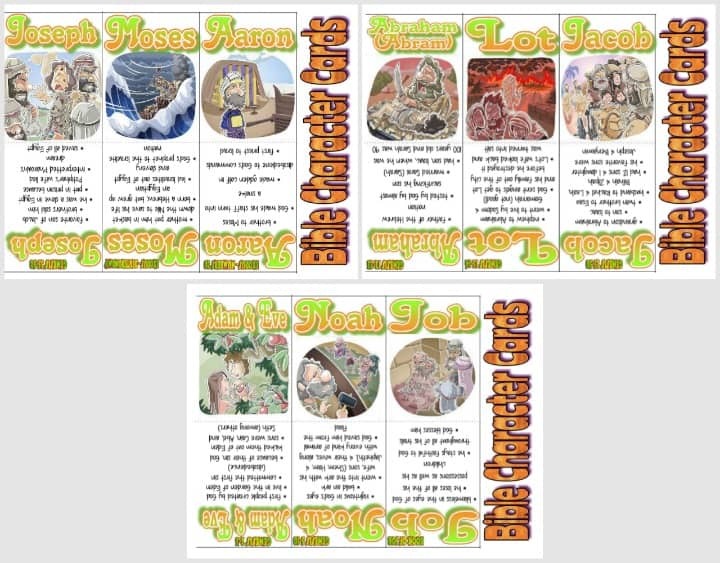 I have made them this way so that they will have the name, Bible reference, and picture on the front of the card and then the name and points about that character on the back of the card. Print them out and cut all of the cards out. Cut the front from the back turning it into 2 cards. Turn over all of the cards and play the memory game, pairing up the front and the backs of the cards. Print them out and give them to the children as you study each character. They can try to collect them all. Print them out and give them as rewards. Print them out and use them as trivia questions. What a wonderful resource. Thank you for your hard work and willingness to share. Tony Kummer (Editor) reviewed & updated this page on : August 18, 2016 at 11:02 pm. All our content is peer reviewed by our readers, simply leave a comment on any post suggest an update.